Viscos motor-car oils, greases & carbide, 1927. Homepage. This page: A glimpse into the price of motor oils and other products during the 1920s. Viscos oils and greases, 1927. This leaflet for "VISCOS" brand motor oils, greases and related products, was issued in July 1927. The supplier in this instance was M. Thomas, of 11 Princess Square in Plymouth. This address had been used by a variety of businesses in earlier days, but evidently by the 1920s it would be vintage-era motorists that would be frequenting the premises, to buy consumables needed to keep their car(s) in fine fettle. 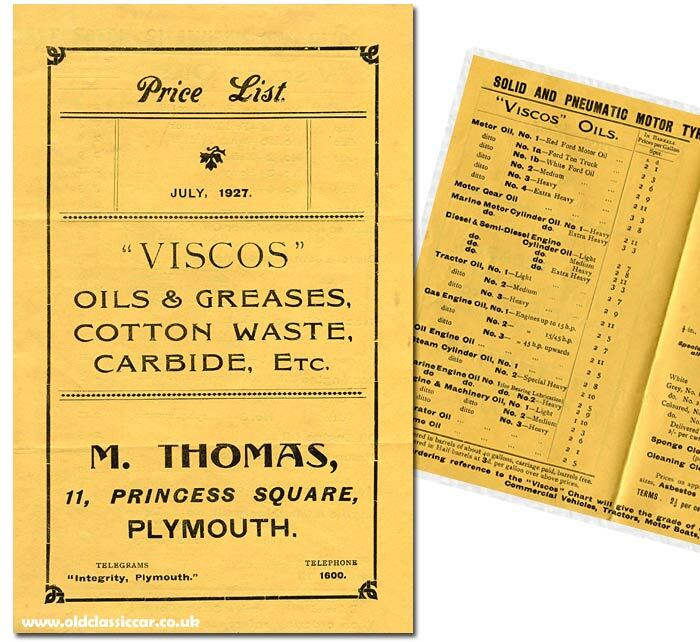 Evidently, Viscos oils were one of the main sellers at M. Thomas' emporium. Below are example prices for just some of the products they held in stock, supplied in one-gallon barrels. "... a colourless hydrocarbon gas, poisonous, and of characteristic odour. It was at one time employed for car lighting and is now occasionally used as a dope for enriching alcohol fuels." Drivers' tyre requirements could also be accommodated, as solid and pneumatic tyres, plus the all-important inner tubes, were also offered. I've yet to find any more information on Viscos-brand oils in particular, but if any does emerge I'll add it in here. The collecting of items relating to fuel and oil suppliers from byegone days, is covered in this article.